I often get asked whether I remove the care tags from my scarves. To me, the look of even the most beautiful scarf in the prettiest knot gets diminished by a care tag which shows, which is why I take mine off. It is of course possible to leave the tag on, and hide it in the basic bias fold. 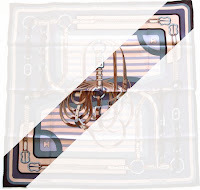 Although this is an effective method, it also means that parts of the design will always remain unseen. I consider this a true loss, as most scarves have very different aspects when folded along both diagonals. 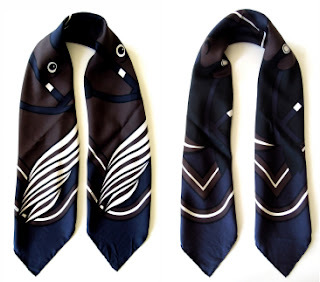 But even scarves with limited colors and patterns (see Quadrige below) come out differently enough for me to remove the tag. I have very few scarves where it truly does not matter which way they are folded, and with most of them the care tags have naturally come loose over time, at which point I'll remove those too. 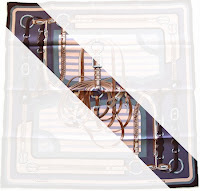 In my personal view, a missing care-tag does not devalue an Hermès scarf. After all it is just an instruction on how to clean a scarf. However, there is a value/important aspect to care tags, as their sizes, colors, designs and positions on a scarf have changed over time. As such they can be invaluable tools when trying to determine the age or issue year of a particular vintage find, or for authenticating a scarf. I therefor keep my tags, along with the invoice and the reference tag (if available). these can be stored in envelopes.. I also keep a photo of the tag when it was still attached to the scarf. In addition, I enter all available information on a scarf into a computer spread sheet (name of design and designer, from which collection, year of original issue, format, material, reference number, CW, purchase date and cost). Alternatively, this info can be written on a card, and included in the envelope or folder. Looking at all comments it seems that you are in very good 'spreadsheet company', dear Scarf Addict! PS. I tried to leave a comment on your blog today, but couldn't convice the word verification that I am not a robot! Hallo, ich habe gelesen, dass Sie perfekt Deutsch sprechen. Also ich finde, ein Tuch sieht ohne Etikette einfach besser aus. Hallo Sanne, herzlich Willkommen in unserer Plauder-Ecke. Es freut mich, dass Ihnen die Archivierungs Idee gefällt, und hoffe Sie hier bald einmal wiederzusehen! I do exactly the same! Great post! Thank you for addressing the issue of care tags. I always remove the care tags from my cashmere/silk and mousseline scarves but was reluctant to remove the care tags from my carres. No longer thanks to this post! I also keep a data base on Microsoft Excel so I can keep track of what I have and the colorways. Happy snipping dear Marilyn, and thank you for sharing your spread sheet program! Ah the care tag dilemma!! This is a great idea to keep it with the purchase tag and invoice. I can't seem to bring myself to cut the care tags off but your absolutely right it does limit how you can fold and wear the scarf especially gavroches. Your post and the comments have left me feeling very disorganised and in need of an better scarf recording system, I remember buying all of them but I'm not good with dates. Think I'll start writing a little each time! So glad you found the post useful, my dear AngelaB! Like you, I also keep a spread sheet of my other H purchases (it certainly illustrates the price increases over the years..) Have a great rest of the week! Just brilliant - only you can illustrate so wonderfully how each fold and each corner will reveal its own unique facet of a scarf. 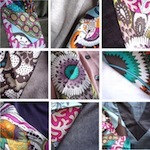 And how valuable and meaningful it is to catalogue our scarves so we can fully enjoy and appreciate our silk treasures. Thank you so much for sharing yours - mine is very similar. May I say that your Travel Pochettes are out of this world extraordinary! 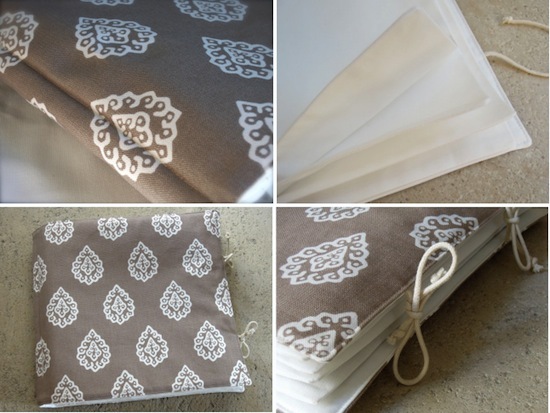 Only you can create such an ingenious design and produce such impeccably elegant pochettes. 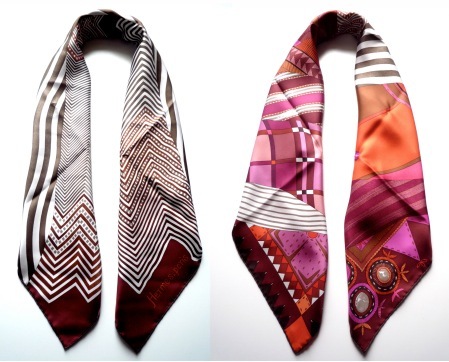 What a pleasure it will be to travel with our scarves - finally no more worries! Your outfit from the previous 'olive' post is incredibly lovely. And your joyous posts from your trip to England are so very beautiful - the picturesque coastline photo is breathtaking. I've never seen anyone look as elegant and gorgeous as you on the beach! I love how the dots connects to the things we love -between the colorful egg timer and your delightful new LdT. Dear MaiTai - Your posts, as always, are so beautiful. You continue to amaze and inspire. I like your file system. I personally have all the same data entered alpabetically into a smart address book to keep tabs of things, but I admit I have never thought about keeping care tags before. I shall have to start! 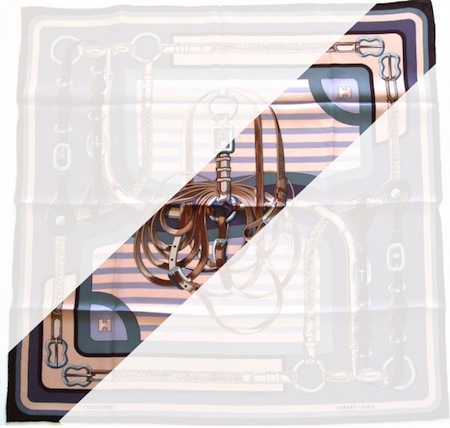 P.S Can't wait for the scarf pochettes to arrive. With those and Muji I will have the perfect scarf storage system! Treated myself to a package of Hermes drawer liner last week so am all good to go! What fun it must be to browse in your 'address book', dear Tara! The pochettes should have arrived by now, please drop me an email in case they have not. Love Muji too, and am also a fan of the H drawer liner. Have fun organising! Hope you are having fun enjoying 'the other side' of your scarves, dear Kate. I have very special and happy memories of Carmel, please say hello to the beach from me. So glad to learn I am not the only OCD type here who keeps a spreadsheet of her scarves... ;-D I, too, have grappled with the decision to leave or remove the care tags, as I feel restricted by the limited folds available when trying to hide them. Thank you for helping me make that decision. It feels so liberating! The first cut is the deepest.. great song, and true for care tags too ;-) Have fun snipping away, dear cakeymakeybakey! Yes, spreadsheet here, too, LOL. And pouches for my invoices which fill a binder... Most of my scarves still have the care tag, I tend to wait until they start to get very loose, then snip them off. I take your point about the limitations and maybe I will be braver soon and snip more quickly. Thank you for such great ideas, dearest MaiTai. I was thinking of photographing my scarves for insurance purposes, and now I'll follow your brilliant suggestion of photographing the tags as well. Too bad for me that I failed to save most of my reference tags. Any recommendations on how to remove the large care tags on the dip dyes? What a great post, my dear MaiTai! I totally agree with dear Scarf Enthusiast saying that 'your Travel Pochettes are out of this world'! So elegant, practical and pretty!!!! You have an amazing imagination, my dear! 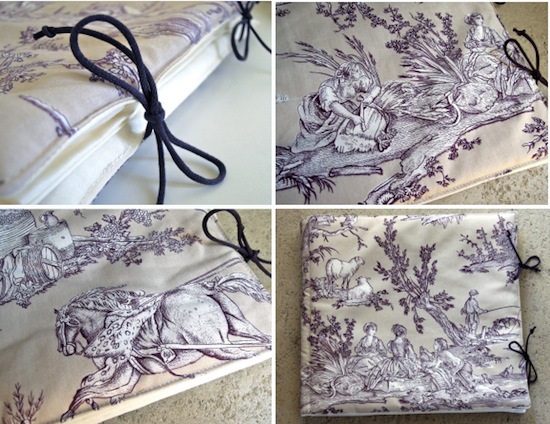 So happy you enjoyed the post, my dear Manuela, and thank you also for the kind praise for Ms Pochette. Wishing you many fun adventures with her! Autumn seems like the perfect time to catalogue your treasures, have a cosy time curating! What a great post today. I have tended to fold in one direction because of the tag but felt the tag should be left on. I will now snip away (carefully!). I can vouch for how lovely the pochette is as mine came the other day. I can't wait for a trip away to use it. I have been keeping a little book which has details of place of purchase, colour and title of scarf and cost in country of purchase and translation into our Australian dollars. I also write down on each scarf page the date I wore it. This is so I can tell how much value I have from each scarf. My first purchase was the beautiful 'Au fil du carre" which has a white background, bright green edge and pattern in fuchsia and purples. It cost me $520 in Sydney, Australia. After 33 wears that now comes down to $15 a wear!! Thanks for the catalogue ideas and Marilyn's computer advice. Thank you for the kind comment, dear Melissa, and for sharing your cost per wear calculating method. It could be an effective tool when editing a collection! I, too, remove and keep the care tags, receipts and a spreadsheet, as well as periodic photos of my scarf storage. My insurance company has said the spreadsheet and photos would be useful documentation in event of a loss. CS: I use a thread snipper made by Wiss. The points are very sharp and the style gives you a lot of control over the cutting blades. I also try to work on the back side of the care labels when possible, with the fold of the label, to snip the threads from there. 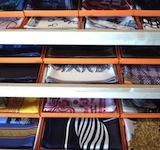 It's a very good idea to take periodic pics of the scarf storage, many thanks for sharing. Thank you also for sharing the brand of your thread snipper. Mine have sharp points too, but work like a regular pair of scissors. Will try out Wiss snippers next time! Pam: Thank you for your suggestion of Wiss thread snippers, and also working from the back side of the labels. ITA with MaiTai, the suggestion of taking periodic photos of the scarf storage is a great one. Thanks for sharing. It's good to know that a spreadsheet will be useful as well for insurance purposes. Thanks, Pam. I've thought it would be fun to create one anyway, but it helps secure my silk investment, I'll get right on it. MaiTai, dear, I'm copying all of your ideas for the database, and label storage! My apologies--I didn't realize you had already linked to this in your subsequent post. It's all thanks to you, dear Pam! I have never seen a thread nipper previously, it looks like a great little tool. Will get one when at the habberdasher next time! Phew! Thrilled to know you remove the tags as well. I've always disliked them showing. Now a filing system? Hadn't thought of that but it's probably important for future generations. I agree with you on the importance of tags for future generations, a beautifully recorded collection can save new owners months of sleuthing and guess work! This post is really interesting, but I had a big surprise after checking my scarves. I own 8 Carrés, one mousseline 90, and one mousseline 140 (plus the "fête de la couleur", but it's so small you can't do any knot with it). out of these 10 scarves, only one (Sulfure et presse-papiers II) looks different depending onthe direction of the basic bias fold. I have never worn my scarves much, I always feel old and “BCBG" with one. I hope I will not feel this way with my new scarf! Congratulation on your beautiful new scarf! It sounds as if your preference for scarf designs might be symmetrical, which explains why your scarves look similar in both axis. Hope you like some of the knots and styling suggestions here, and that your beautiful new "Point d'orgue' becomes a cherished staple of your wardrobe! Actually, except for the last one, all scarves were gifts, and chosen for me! Your blog seems to be the best source for knots. All others seem to repeat the knots from the Hermès booklet, but I don’t feel comfortable with them. At least, I already own a scarf ring to try all your wonderful ideas! 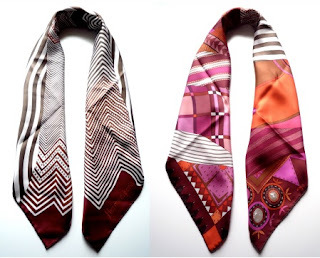 Hello All, I know this is an older post, however this was the first item that came up when I Googled looking for a spreadsheet for my H scarf collection (well done MT and friends). Would it be possible for someone to post a link for an easy to use spreadsheet? I would greatly appreciate your help with this. Hello Maisie, I use a Mac and create my spreadsheets with the filemaker application, so I'm not of much help here... Hope someone can step in, or perhaps google 'spreadsheet', and work with a generic one? Wishing you the best of luck! J'hésite depuis longtemps sì couper ou pas les étiquettes... comment fait-tu pour le pressing? Sì il n'y a pas d'étiquette où ils vont attacher le petit papier? Interdiction d'utiliser même une petite épingle sur la soie,et donc? Pour l'instant elles sont toutes en place mais il est vrai que le pliage est limité, dilemme!!!! Je ne savais pas qu'on pouvait faire ça!! Normalement l'eau est interdite (Hermès dixit), il y a le risque d'égorgement,comment fait-tu pour ne pas abimer tes carrés? J'aimerais (beaucoup!) un post sur le sujet. Après avoir eu le roulotté d'un carré complètement applatit par le ferre à repasser je demande au pressing de procéder uniquement au lavage et je me charge du repassage. Merci beaucoup pour toutes les précisions que tu pourras fournir sur l'argument que,j'en suis sure, intéresseront aussi tes lectrices.